* NSF award EHR-0412390 (Boston Science Partnership) Research in our lab is concerned with studying how students develop chemical thinking and reasoning over many years of training in chemistry (middle school, high school, undergraduate, and graduate school), how problem-solving in chemistry is similar to and different from problem-solving in other disciplines, how a focus on green chemistry influences students' learning of chemistry, how scientists can learn from teachers to communicate science more effectively, and policies and practices needed to ensure chemical literacy. The unifying feature of our work is that it is directed at improving equity and creating capacity for students, particularly in urban public education, to have access to learning chemistry. 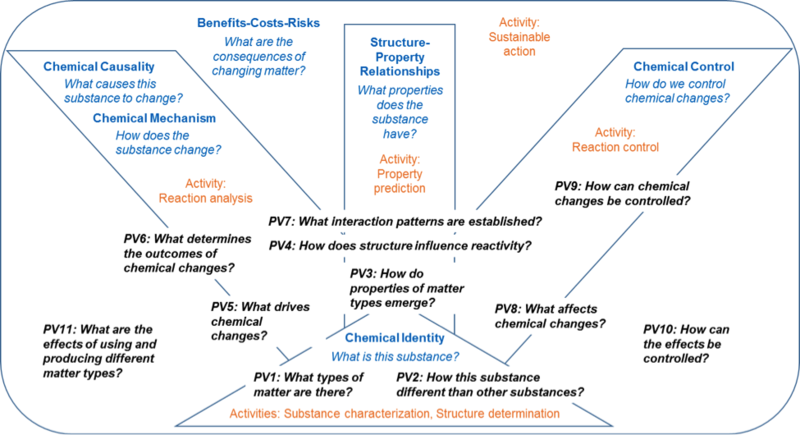 Chemical Thinking framework, which characterizes the practice of chemistry in terms of core questions that chemistry permits answering (blue), activities of chemical scientists and students of chemistry (orange), and progress variables (PVs) along which learning of chemistry can be measured and mapped. Adapted from Sevian & Talanquer (2014) DOI: 10.1039/C3RP00111C. April 2019: Dr. Sevian, Dr. Ira Caspari, and Raúl Orduña Picón presented talks at the Annual NARST Conference in Baltimore, MD (March 31 - April 3). Dr. Sevian was invited to present in the presidential symposium on science teacher professional development. Ira presented on "Organic Chemistry Professors’ Teaching Orientations and Their Students’ Abstraction during Problem Solving," and Raúl presented on his dissertation work, "Conceptual Profile of Substance: Representing Heterogeneity of Thinking and Speaking about Substance in Chemistry Classrooms." Dr. Stephanie Murray and Clarissa Keen also presented talks at the National ACS Meeting in Orlando, FL (March 31 - April 4). Stephanie presented on "Exploring Teaching Noticing, Interpreting and Acting in Response to Written Student Work" and Clarissa presented on "Embracing students’ challenges in general chemistry lab activities". Dr. Sevian was also invited to present at ACS in a symposium honoring Diane Bunce. Congratulations as well to visiting professor Edenia Amaral, who presented a poster and a talk at NARST, and former visiting professor and current collaborator Orlando Aguiar, who presented a talk at NARST on a project with Dr. Sevian looking at "Chemistry Teachers’ Intentions and Students’ Epistemic Agency in Communicative Patterns in the Classroom." March 2019: Daniliz Capellan Pichardo and Raúl Orduña Picón, and Jessica Karch attended the New England Regional SACNAS Meeting held at Brandeis University on March 23. Jessica Karch presented a talk. See Photos for a view. February 2019: Congratulations to Jessica Karch and Raúl Orduña Picón on being accepted to the NARST 2019 Sandra K. Abell Institute for doctoral students in science education. January 2019: Congratulations to Raúl Orduña Picón on passing the oral qualifying exam and achieving doctoral candidacy! December 2018: Congratulations to Qausarat Ogunneye on being awarded an Oracle Undergraduate Research Fellowship for the spring 2019 semester to work on her research with Klaudja Caushi! October 2018: Congratulations to Jessica Karch on passing the oral qualifying exam and achieving doctoral candidacy! October 2018: Klaudja participated as a mentor at the Brockton NAACP STEM career night at Brockton Public Library as part of the Massachusetts Governor's STEM Week Initiative. July 2018: Hannah met Keith Taber in Cambridge, England. June 2018: Jessica is in Kiel, Germany, at IPN, working with our collaborator Sascha Bernholt and his graduate student Marc Rodemer. May 2018: Congratulations to Klaudja Caushi on graduation from UMass Boston! And we are so happy that Klaudja will join us in the fall as a PhD student. April 2018: Congratulations to Jessica Karch on being awarded an NSF Graduate Research Fellowship for 2018-2021!!! March 2018: We are so happy that Shandira Soto and Camila Muneton, students at Boston Latin Academy, are working on advancing their science fair project on determining what is the identify of a mystery metal that they found, with mentoring by Raúl Orduña Picón in our lab. Shandira and Camila won first prize for their project at the Boston science fair (Massachusetts Region VI) on March 3, and are headed to the Massachusetts State Science Fair and also to the International Science Fair. This is also featured in the UMass Boston News. We are all cheering for you, Shandira and Camila!!!! March 2018: Klaudja Caushi and Florence Wanjiku presented posters at the ACS conference in New Orleans. Klaudja presented about "Characterizing teachers' approaches to formative assessment in chemistry and other STEM classrooms". Florence presented about "Validating the use of the SAMM survey in 6th and 7th grades to to elicit student thinking about the particulate nature of matter". Steve Couture also gave two talks at the ACS conference, one on "Epistemic games in substance characterization" and the other on "A green electrochemistry experiment for general chemistry". February 2018: Congratulations to Clarissa Keen on passing her literature seminar! November 2017: Congratulations to Steve Couture on being awarded the prestigious CIBA Award by the Green Chemistry Institute of the American Chemical Society. Steve will present at the national ACS conference in New Orleans about the development, implementation and evaluation of a greener electrochemistry lab for general chemistry (based on his mentorship of Nayer Abd El Meseh in his undergraduate capstone project) and also present his master's thesis research on epistemic games in chemistry. Congratulations also to Steve on the acceptance of his proposed workshop at NSTA 2018 on epistemic games in chemistry, which he'll present at prime time to an audience of up to 200 teachers! October 2017: Congratulations to Klaudja Caushi on winning a Grants-in-Aid travel grant from the Northeastern Section of the ACS (NESACS) to attend and present at the national ACS conference in New Orleans in March 2018! September 2017: Alumni news: Congratulations to Gaby Szteinberg on winning the Outstanding Staff Award from the College of Arts & Sciences at Washington University in St. Louis. We're all so proud of you, Gaby! August 2017: Dr. Sevian has been promoted to full professor! Here she is presenting about the ACCT project research at the ESERA conference in Dublin. July 2017: Congratulations to Josibel García Valles on landing a job at Fenway Health! Congratulations to Klaudja Caushi on receiving a UMass Boston Beacon Student Success Undergraduate Fellowship to support her internship doing research in our lab this summer! We wish the very best to Courtney Ngai, who will begin a postdoc at Colorado State University this summer. Congratulations to Becca Lewis on the birth of Jonah, who nearly arrived during the Science Fair in Boston, but Becca drove herself to the hospital in time to deliver him. Congratulations to Josibel García Valles on earning Honors in Biochemistry for her thesis on pupillometry to study cognitive load while solving chemistry problems! Congratulations to Nayer Abd El Meseh on graduating and completing his Senior Capstone in Environmental Science with his project on a novel Green Chemistry laboratory experiment on electrochemistry and batteries, in collaboration with Steve Couture! Congratulations to Felix Nampanya on graduating with a BS in biochemistry and landing his first job, at Dana Farber Cancer Institute! Congratulations to Vesal Dini on the publication of his first paper from his PhD dissertation at Tufts, published in Phys. Rev. Phys. Educ. Res., titled "Case study of a successful learner's epistemological framings of quantum mechanics"! And congratulations to Raúl Orduña Picón and Jessica Karch on being accepted to present posters at the Gordon Research Conference on Chemistry Education Research and Practice in June! April 2017: The RSC journal, Education in Chemistry, has highlighted Melissa's and Hannah's new CERP paper on organic reaction mechanism problem solving in its latest issue here! The "Teaching Tips" section is especially excellent. The highlight is also posted on the journal's Twitter and Facebook sites. April 2017: Jessica Karch's first talk at ACS was excellent! She presented about epochs observed using eye tracking during chemistry problem solving. March 2017: Courtney Ngai successfully defended her dissertation on March 15. Congratulations Dr. Ngai! March 2017: Melissa Weinrich will begin as a tenure-track assistant professor of chemistry at the University of Northern Colorado in August 2017. Congratulations Melissa! March 2017: Our ACCT Team led an all-day workshop at the BPS Science Teacher Leader retreat on March 10 on noticing students' thinking and analyzing ways that teachers act on what they notice in videos of classroom discourse, and then we participated in district preK-12 science curriculum alignment work on March 11. March 2017: Congratulations to the whole ACCT Team on our article on Better Formative Assessment in The Science Teacher. The journal chose our article to feature in a video (https://youtu.be/9d8QpoV6U-c) and on their Facebook page (www.nsta.org/TST/Facebook). February 2017: Congratulations to Jessica Karch on passing her literature seminar! January 2017: Our NSF-funded Assessing for Change in Chemical Thinking project is featured on the UMass Boston News. More information on the project is available at www.acctproject.org. November 2016: Congratulations to Prajakt Pande on his new paper published in Studies in Science Education, called "Representational competence: towards a distributed and embodied cognition account"! September 2016: Courtney gave an outstanding presentation at EuCheMS in Seville, Spain, on "How students classify and differentiate substances, revealing chemical identity thinking". The week before that, she also gave a well-received talk at ECRICE in Barcelona on "Characterizing the link between chemical identity thinking and biochemistry contexts". Congratulations, Courtney! August 2016: Congratulations to Josibel García Valles on her successful oral presentation on "Application of Pupillometry in Chemistry Education Research" in the Research in Chemistry Education symposium at the ACS conference in Philadelphia! July 2016: The Sevian Research Group welcomed Ira Caspari as a visiting scientist. Her advisor, Dr. Nicole Graulich, joined us as well for one of our group meetings. June 2016: Dr. Sevian and Raúl traveled to Brazil to work with a collaborator, Eduardo Mortimer. In the picture below, they are in the mountains overlooking the city of Belo Horizonte! February 2016: Congratulations to Courtney Ngai on being selected as a delegate for the Northeastern section of the American Chemical Society to participate in the European Association for Chemical And Molecular Sciences Chemistry Congress, to be held in Seville, Spain, in September 2016. February 2016: Congratulations to Steve Couture on passing his literature seminar! January 2016: Welcome to our newest graduate student, Raúl Orduna Picón! September 2015: Our new graduate student, Steven Couture, has joined the Sevian research group! May 2015: Congratulations to Dr. Sevian's most recent graduate, Dr. Steven Cullipher! See the Photos page for pictures from the day of the hooding ceremony. Spring 2014: Check out a video on YouTube about freshman chemistry majors teaching 8th graders in Boston about chemistry through the medium of learning model based theater productions!